This course explores the history and core tenets of the major (normative) streams of the classic World Religious traditions—Judaism, Christianity, Islam, Buddhism, Hinduism, Daoism—as well as less discreet spiritual phenomena, such as those practices by the indigenous peoples of sub-Saharan Africa and the Americas. Each of these traditions will be studied in their cultural and political context, with frequent reference to their interactions and conflicts with other monotheistic and non- monotheistic cultures, using the most recent scholarly theories and methodologies. We will learn many concepts in the study of religion, such as myth, ritual, cosmology, theodicy, legalism, and the effects of geography and modernity. We will discuss the various ways each of these religious traditions have been in continual dialogue over the past millennia, and how this interaction has both reified and diversified traditional beliefs and practices. Finally, the multitude of sources we encounter will help us to develop a more complex vocabulary when discussing the various branches, sects, societies, ethics, and communities associated with all these traditions. Students will leave this course with a thorough sense of the historical trajectory of the interacting cultures of the world from ancient times to the present. Students will be expected to learn many of the key figures, texts, beliefs, and geographies associated with each of these traditions, as well as to have a visual sense of the migrations and political instantiations of their adherents across the centuries. This course explores the history and core tenets of the major (normative) streams of the Abrahamic traditions: Judaism, Christianity, and Islam. Each of these traditions will be studied in their cultural and political context, with frequent reference to their interactions and conflicts with other monotheistic and non-monotheistic cultures, using the most recent scholarly theories and methodologies. We will learn many concepts in the study of religion, such as myth, ritual, cosmology, theodicy, legalism, and the effects of geography and modernity. We will discuss the various ways all three traditions have been in continual dialogue over the past two millennia, and how this interaction has both reified and diversified traditional beliefs and practices. Finally, the multitude of sources we encounter will help us to develop a more complex vocabulary when discussing the various branches, sects, societies, ethics, and communities associated with all three traditions. Students will leave this course with a thorough sense of the historical trajectory of the interacting cultures of the Near East, Mediterranean, and Europe from Biblical times to the present. Students will be expected to learn many of the key figures, texts, beliefs, and geographies associated with Judaism, Christianity, and Islam, as well as to have a visual sense of the migrations and political instantiations of all three traditions across the centuries. This is a reading-intensive course. Instead of relying on a textbook, students will be introduced to primary and scholarly sources (all in English translation) through engagement with a variety of authors and publications. Finally, students will be asked to write two brief essays reflecting on key aspects of religious experience: communal practice and liturgy/poetry. Life is full of moral questions. Some of these questions are large and obvious, others are small and mundane. How should foreigners be treated? Must I apologize when I feel I am still in the right? What does it mean to honor my parents? May I take another life if my own is in danger? Our responses to the smaller, routine questions often pass by unnoticed, answered through pre-learned principles and normative standards. The larger questions can instigate long periods of self-reflection, moral awakenings, and new motivations for life. Sometimes, our engagement with moral questions occurs on a sliding scale: Should I hold the door open for the person ten steps behind me? Should I hold the door open for a person ten steps behind me who is carrying a heavy package? Should I hold the door open for an elderly person who is ten steps behind me? Should I hold the door open for the President of the United States? At other times, one answer always suffices: Should I murder a noisy neighbor? Studying the answers to life’s most challenging (or apparently simple) moral questions can give us a unique window into the underlying ethics and virtues of a cultural worldview. What errors are harshly punished and what easily forgiven? Who are identified as the weakest and neediest and how are they protected or shunned? How are moral answers created, proved, and taught to future generations? 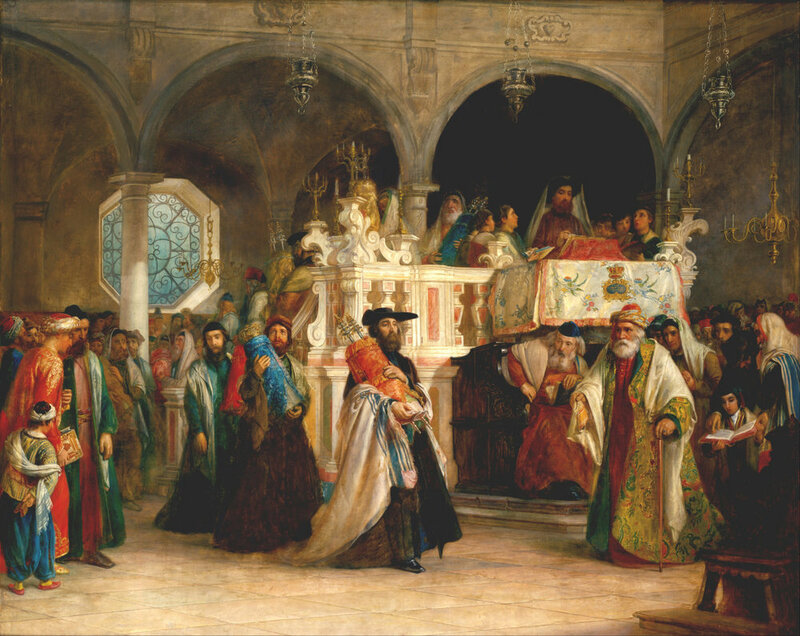 Judaism is often called a “world religion.” But of that group—which can include traditions as diverse as Christianity, Islam, Confucianism, Hinduism, and Buddhism—it has the fewest adherents (approximately fifteen million) and only a single country where it comprises a majority of the population (Israel). Jews are about two percent of the total population of the United States. Why, then, is Judaism so commonly discussed? Why are its texts so widely known? Why have its people so often been targeted for both plaudit and discrimination? This course explores the religious and cultural life of the Jewish people. Interweaving three thousand years of history, theology, folklore, philosophy, and literature, it seeks to give students a basic working knowledge of the many foundational texts and ideas that have made Judaism so important in contemporary intellectual and cultural life. The semester is built around understanding the meaning and history of Judaism through how Jews have ordered things: liturgical time; communal and individual activities; the language of theological awareness; human and divine governance; and the relationship between human society and nature. This class will introduce students to this fascinating and complicated people. The “Holocaust” (Hebrew: Shoah; Yiddish: Horban) as word and idea has a potent force in contemporary society. International leaders who oversee acts of human atrocity are often called “fascist,” “Nazi,” or “like Hitler.” Anti-Semitism, an integral but complex antecedent to the events of the Holocaust, continues to be a focus of international condemnation and opprobrium, though likewise of recurring frequency. Fairly sizable corners of the book market and the Internet are devoted to detailing Jewish conspiracies, with such purported treacheries resembling those found not only in the medieval and early modern periods, but in nineteenth and twentieth century Europe as well. Islamic anti-Semitism has become a potent force in the Middle East. Linked with the de-legitimation of the State of Israel through the labeling of Israeli actions as “Nazis” and “genocidal,” this language calls on the historic persecution of the Jews at the hands of European Christians for its contemporary political and cultural resonance: a meek David becomes a fascist Goliath. But what was the Holocaust itself? Why did it happen primarily in Eastern and Central Europe? What were its antecedents? Is Germany the only culpable nation? In the wider context of the Second World War, what does culpability even mean? Do numbers matter? Whys is mass death in a camp or factory different from mass death on the field of battler? This course provides an historical account, a psychological analysis, and an occasion for philosophical contemplation on the Holocaust. We will examine the deliberate and systematic attempt to annihilate the Jewish people by National Socialist Germany during World War Two. Although Jews were the primary victims, Gypsies, the handicapped, homosexuals, Jehovah's Witnesses and political dissidents were all targeted for extermination by the state as well. We will discuss their fates as part of a larger reckoning with the power of governments and ideologies to motivate private citizens and ordinary soldiers toward great evil. What is it like to stand before the Throne of God? To hang on the cross alongside Christ? To explore the Heavenly Garden of Hidden Mysteries? This course will explore these and other questions from the writings of Jewish, Christian, and Islamic mystics from the Biblical period to modern times. Beginning with the Israelite prophets, we will study the lives of individual mystics, engage analytically with mystical writings, and discuss the context and reception of mystical ideas in both the past and present. This course will ask students to ponder the nature of how religious knowledge is found and who can find it. We will also see the many ways women have played a unique role in defining the mystical heritage of the West. This class is for anyone who has ever wondered what it is like to have a life devoted solely to searching for the nearness of God. The study of mystics and their insights have long captured the imagination. From the appeal of the desert monk St. Francis to the novel The Name of the Rose to the spiritual quest of Cheryl Strayed in Wild, mystics, ecstatic’s, and prophets abound not just in literature, philosophy, and poetry but in contemporary cinema and dance as well. Hidegaard von Bingen, St. John of the Cross, Abraham Abulafia, Ibn Al-‘Arabi—these are household names in many religious communities across the world. All four were mystics, yet each has also had a profound influence on the imaginations of religious and secular people alike. The interaction between religion and science is one of the most interesting and fraught issues in contemporary society. Some scholars trace the beginning of this divide as far back as the days of classical antiquity, seeing in the writings of pre-Socratic philosophers the foundations of a materialist worldview. Others place its origins with Galileo and Copernicus, in the Scientific Revolution and the beginning of European modernity. Still others see the great separation as only two or three centuries old, arising with the European Enlightenment, or even later, nearer to the end of the nineteenth century when Darwin’s theories gained widespread acceptance. This course will survey this great debate, challenging some of its core assumptions, as well as continuing to ask the most fundamental and interesting questions about the very nature of “religion” and “science” themselves. At one level, this course is an overview of existing theories and claims about religion and science. We will look at some of the classic case studies in religion-science history, as well as discuss the writings of the “New Atheists” and their opponents. In both the popular media and the world of scholarship, this front line is still very real. However, in this course we will also spend time with writings that step back from the fray, with people and ideas that attempt to find new languages or sets of principles that not only negate a “great clash” but also offer a more compelling vision of humanity’s perennial quest for truth, knowledge, and meaning.